MANAGEMENT by the staff of Zoller Consulting, Inc. GARAGE DOOR ACTIVITY INDEX REVISITED 42 International Door & Operator Industry™ The most commonly asked question in any industry gathering is "how's business?" and by extension "how is the industry doing?" Real answers are too complex and nuanced to be useful for conversation and citing complicated statistics is bound to create irritation, or even arguments. People want simple and quick answers, thus the most common response is a non-answer: "it's fine." 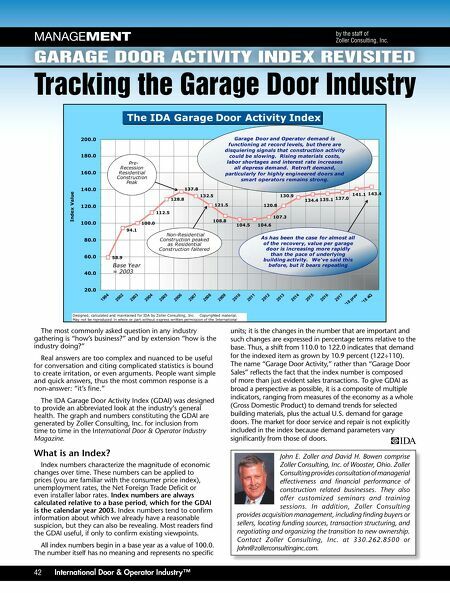 The IDA Garage Door Activity Index (GDAI) was designed to provide an abbreviated look at the industry's general health. The graph and numbers constituting the GDAI are generated by Zoller Consulting, Inc. for inclusion from time to time in the International Door & Operator Industry Magazine. What is an Index? Index numbers characterize the magnitude of economic changes over time. These numbers can be applied to prices (you are familiar with the consumer price index), unemployment rates, the Net Foreign Trade Deficit or even installer labor rates. Index numbers are always calculated relative to a base period, which for the GDAI is the calendar year 2003. Index numbers tend to confirm information about which we already have a reasonable suspicion, but they can also be revealing. Most readers find the GDAI useful, if only to confirm existing viewpoints. All index numbers begin in a base year as a value of 100.0. The number itself has no meaning and represents no specific Tracking the Garage Door Industry units; it is the changes in the number that are important and such changes are expressed in percentage terms relative to the base. Thus, a shift from 110.0 to 122.0 indicates that demand for the indexed item as grown by 10.9 percent (122÷110). The name "Garage Door Activity," rather than "Garage Door Sales" reflects the fact that the index number is composed of more than just evident sales transactions. To give GDAI as broad a perspective as possible, it is a composite of multiple indicators, ranging from measures of the economy as a whole (Gross Domestic Product) to demand trends for selected building materials, plus the actual U.S. demand for garage doors. The market for door service and repair is not explicitly included in the index because demand parameters vary significantly from those of doors. John E. Zoller and David H. Bowen comprise Zoller Consulting, Inc. of Wooster, Ohio. Zoller Consulting provides consultation of managerial effectiveness and financial performance of construction related businesses. They also offer customized seminars and training sessions. In addition, Zoller Consulting provides acquisition management, including finding buyers or sellers, locating funding sources, transaction structuring, and negotiating and organizing the transition to new ownership. Contact Zoller Consulting, Inc. at 330.262.8500 or John@zollerconsultinginc.com. 58.9 94.1 100.0 112.5 128.8 137.8 132.5 121.5 108.8 104.5 104.6 107.3 120.8 130.9 134.4 135.1 137.0 141.1 143.4 20.0 40.0 60.0 80.0 100.0 120.0 140.0 160.0 180.0 200.0 1994 2002 2003 2004 2005 2006 2007 2008 2009 2010 2011 2012 2013 2014 2015 2016 2017 '18 prev '18 4Q Index Value The IDA Garage Door Activity Index Base Year = 2003 Designed, calculated and maintained for IDA by Zoller Consulting, Inc. Copyrighted material. May not be reproduced in whole or part without express written permission of the International Pre- Recession Residential Construction Peak Non-Residential Construction peaked as Residential Construction faltered As has been the case for almost all of the recovery, value per garage door is increasing more rapidly than the pace of underlying building activity. We've said this before, but it bears repeating Garage Door and Operator demand is functioning at record levels, but there are disquiering signals that construction activity could be slowing. Rising materials costs, labor shortages and interest rate increases all depress demand. 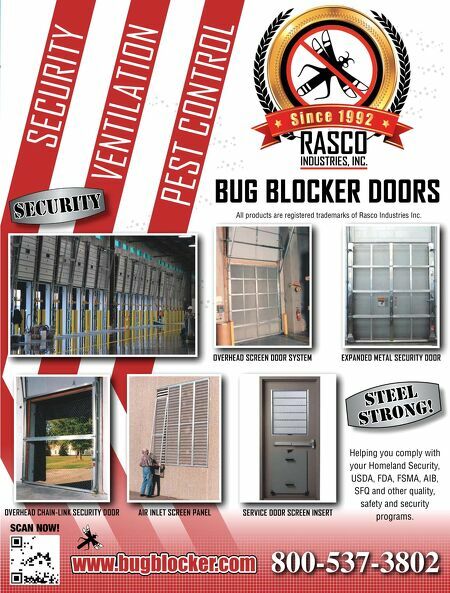 Retroft demand, particularly for highly engineered doors and smart operators remains strong.